Please contact owner Ricky at 337-302-eight five eight five. Boat is located in Lake Charles, Louisiana. 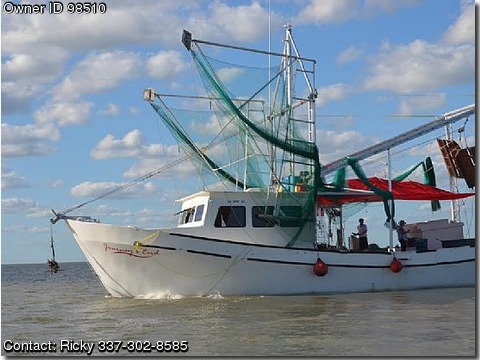 Beautiful 5824 Terrebone lafitte skiff All 6 inch aluminum rigging hydraulic double drum winch new 12 20 aluminum skimmer frames cabin completely finished stove sink , cabin is 2220 two bunks up stairs down stairs shower toilet , 350 gallons fresh water 1750 gallons fuel were building boxes into hull they should hold 150 boxes cull box on top deck holds 60 boxes wash down pump garmin fish finder with built in dept recorder radar resdy.